FORD (Fixed Or Repaired Daily) and 14 Weeks to Go!!! In our case, this is pretty accurate, as the Mothership has now been back to our favorite dealership in Texas, Leif Johnson Ford here in Buda Texas (10 miles outside of Austin). 1st it was the fuel pump and fuel injectors (see last week’s blog). Next it was yet another alternator failure, our 4th since departing in May. You might remember our last alternator saying “I’m done” by way of a small fire 100 miles outside of Fredericton, New Brunswick back in September. That escapade had us camping for 4 nights at another Ford dealership. Well, not more than 4 months later, as we said farewell and thanks to Simon at Austin International, I noticed the “check battery” light on and as we were heading into Austin for our 3 night “ run, rest and relax” at “The Architects House”. My spider senses were telling me to get back to Leif Johnson asap, mostly from past experiences and knowing we were going through some pretty desolate parts of Texas after Austin, along with our newest road manager, Amber Klatt. After much tinkering by our Ford Diesel Technician, Raymond, he said “she was indeed cooked, again”. Ok, no worries, we’ll get her fixed, AGAIN. It’s a bummer but glad we caught it before we departed for more desolate climes. In she went as our friend, Rick Kent (see my birthday blog) picked us up and tourist’ed us all around Austin for eats out and memories made. Steph and I even kept on running and putting in miles around Town Lake trail system, in order to rack up enough miles to drive to San Angelo because of the time delays. So with 150 odd miles in the bank, a few incredible running days with Cedar Fever around Austin’s famous trail’s, we headed back to our favorite Ford Truck Center to pick up the freshly installed 4th Alternator. Locked, loaded and all repair papers signed, we said another fond farewell to Bob, Raymond and Co. and took off across the street (800 yards away), to pick up some groceries for our 3 hour drive to San Angelo, secure our alternator troubles were finally behind us. Or so we thought. I started her up and headed confidently towards the Interstate. With the Ford dealership in sight, I noticed the same “check battery” light back on with added low lights from the dash, just to rub it in. We couldn’t believe what we were seeing. I drove directly to our newest residence, who by now, know us by name and everyone asking if we’d ever thought about buying property at Ford. Our new family invited us to camp by the light of the Ford Moon, just as the freezing rain (I know it’s Texas folks) began to shower down, hard. The manager said, “we’ll get ya’ll goin’ and do whatever it takes to make that happen.” So once again, we camped, got Amber settled in, had another night filled with cold temps, cedar fever coughing and spluttering, and dreams of warm weather and a perfect healthy Mothership. Why am I writing such a long blog (bordering on a novel) about our experiences at Ford, here in Buda Texas? Well, because there is a spirit here, just like everywhere we’ve been privileged to spend time, filled with incredible people, all willing to assist us in the realization of our dream. We have been meeting all the amazing people who work here. Right from service advisor Bob Moore, ensuring the insurance is covered (again), to Raymond, straining his technology wits beyond super human, to Eddy who has shared with us philosophy, Jordanian food and martial arts artistry, all the way to Kent who invited us to stay at his house without hesitation. Even though it was waiting for our tour vehicle to be fixed, that same spirit to assist us remains strong and ensures we reach our goals. This aspect of the journey has continually amazed me of how far people reach to help. So as we finally pulled away and said farewell to the crew at Ford in Buda, it makes us excited for what’s still to come and all the incredible people and experiences we’re going to have for these remaining 14 weeks!!! Thanks everyone, not only at Leif Johnson Ford, but everyone else we were privileged to meet and spend time with in Austin, Texas! 14 Weeks to Go Go! As Matt and Steph hit the ground, I jumped in the driver’s seat. Ten clicks in, and awhile of staring at upcoming maps stirred up enough cabin fever that I changed shoes, locked up, and headed out. On my light jog (soft ‘j’, please) back, I got an enthusiastic wave from a gentleman, half out of his window, and knew the Traipsing Two must be near. Sure enough, I snapped some action shots, and we headed back to Racy Verna (RV) together. I learned the shake system and they were on their way again, so I was too. Still all fidgety in the seat, I nearly careened off the road when I saw a fifty dollar bill waving beneath the windshield blade! Hello! Thank you Anonymous Donor … perhaps the sight of so much spandex (!) is more enticing than we figured. Kids having fun learning Green and 15 weeks to go! Our time in San Antonio rocked with 5 more schools, Christian Academy of San Antonio, Keystone School, St. Anthony’s Catholic school, Our Lady of Perpetual Help and St. Luke’s Episcopal. It was a 2-day run around with 2,000 more kids about the simple daily Actions they can take to grow up green! 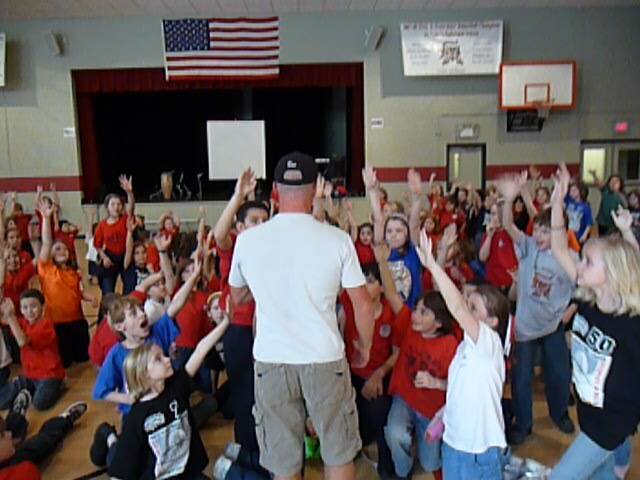 We even did our very 1st church presentation in Shurtz, TX with 500 kids who were so eager to participate; our show went 90 minutes instead of the usual 45! We also had another great event with our partner, Lululemon and with Suzy and Co. at Whole Foods Market. We’re realizing every day, that our tour is really about kids and helping the work their parents and teachers are already doing, by being a 3rd party with more “cool cred” to instill this message of growing up green. Their enthusiasm to implement our top 10 action steps into their lives inspires Steph and I to keep running and keep speaking, as in the words of a teacher who said, “ your tip to turn off the lights will help us get the children to cut our usage and save on the $8,000 a month we spend”. She didn’t even tell us how much they spent on water every month, but rolled her eyes by the high price tag. There’s a whole generation growing up not making the connection. It’s not that teachers and parents don’t care as I’m sure they’re always saying, “turn off the taps, turn off the lights”, just like our parents did. I guess it will take much leading by example and maybe a tour called the Run For One Planet to run into town with a simple message asking them to just do ONE thing really well. Click here to watch Matt and Steph at a school event teaching about Environmental Awareness! As I write these words I am feeling a sense of urgency and the importance of our mission while we still have time out here. Just 15 weeks to go. If I could, I’d just keep running everywhere, in order to keep our message alive and current. It’s not from an arrogant place I say that our work is vital, it’s from the knowledge from our almost 9 months out here running and speaking of how many people are just starting to talk about going green and linking the things going on with the Planet, to some of their personal daily habits. Our tour won’t solve major climate crisis issues solely. 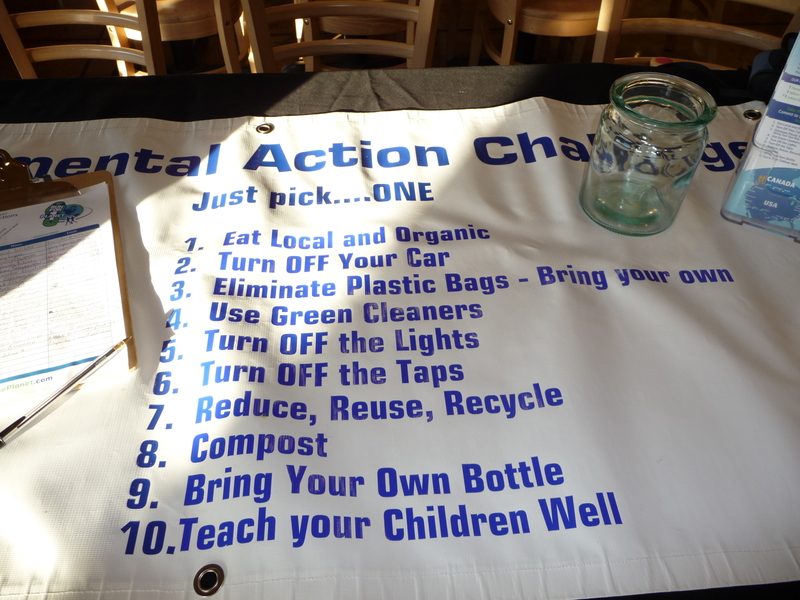 However, we passionately believe that our ability to connect with people by connecting with the pavement has allowed us entry into the grassroots movement which needs to keep rolling and needs to teach this generation coming up, about total conservation and total shifting of how we live day to day. We go between “we’re doing it’ and “there’s so much still needed to be done”. And we’re always learning that small steps really do add up, as long as we keep that as our mantra and our daily connection point to our running, our tour and our mission. Wow, 15 short weeks to go before returning home to Vancouver. I wish we could start again and book our schools by the thousands in order to reach more people. 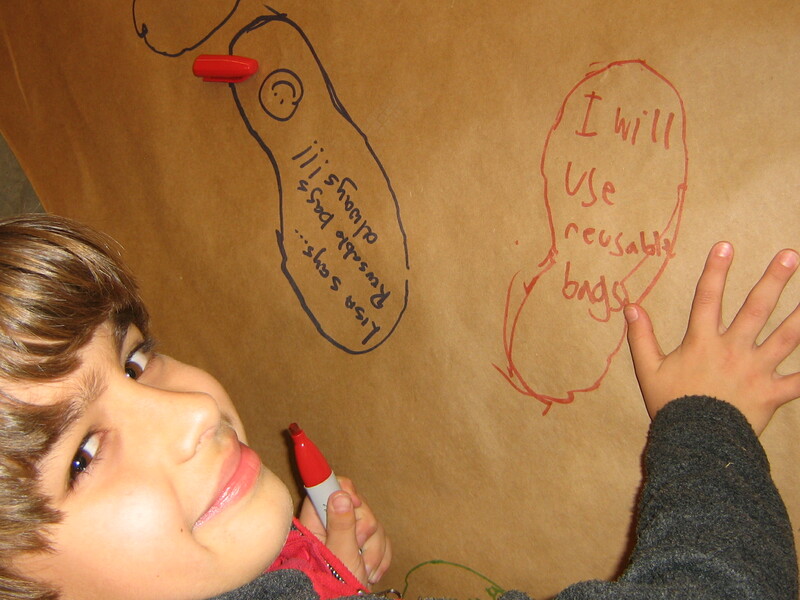 Our Legacy of Action for Kids will have to be our way to keep empowering them to create the kind of world they want to grow up in by supporting their own green projects. This knowledge takes a bit of that urgent feeling off my heart, though it doesn’t take it away completely. I’ll keep running, along with Steph and meet as many of our mini peeps and peep-ettes as humanly possible and impart of message for these next 15 weeks! Watch more of Matt and Steph teaching environmental education at school events here. 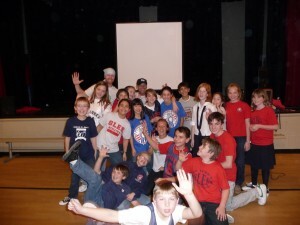 A few weeks ago (1/13/09), Brandon came home from school, very excited about a presentation he had seen at school. From his explanation, it was clearly an environmental group. He told me, “our planet is like a leaky life-boat… and when this planet is gone, it’s not as if we can say ‘oh well, that was nice… and go and find another planet’.” He was clearly quoting the speakers or video he had seen… and he was quite fired-up. He told me the group was going to be at our local Whole Foods that evening, asking for donations. OK, fine — but you’ve seen them already. A few minutes later, when I told him it was time to get ready for Tae Kwon Do, he fell apart. “Mom,” he said, “I can’t go to Tae Kwon Do. 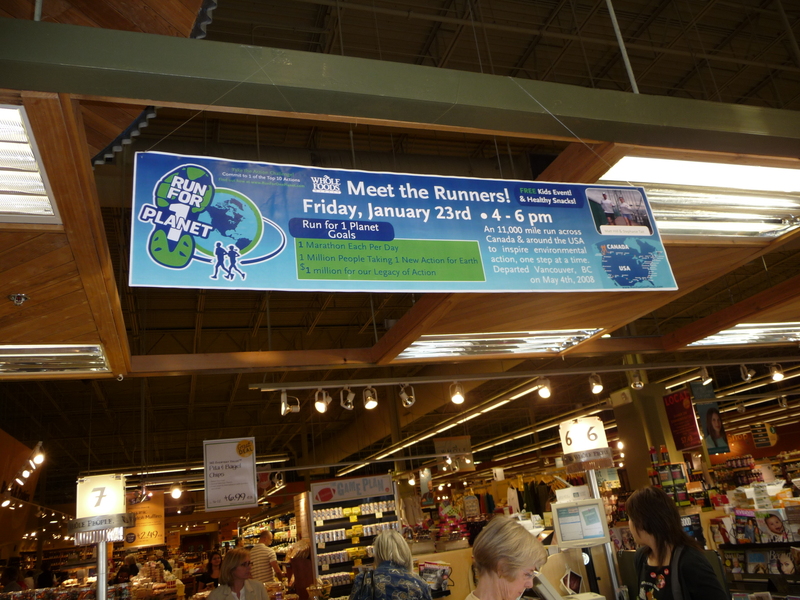 I have to go to Whole Foods….” I wasn’t convinced until, with tears in his eyes he implored, “Mom — this is about our FUTURE. I’m really concerned.” Not much to say about that, now, is there? I was rather annoyed with these people — who did they think they were tugging at this kids heartstrings?! OK, show me their website. http://www.runforoneplanet.org/ I really didn’t have to read it because he’d already quoted most of what was on there, including their entire video. So I called David to say that plans had changed: we were off to Whole Foods instead of TKD. 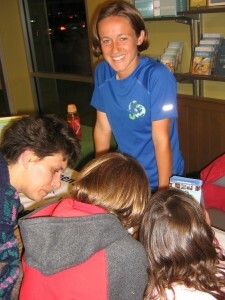 Brandon insisted on taking money he had set aside for Tzedakah (charity) — of course, then Mirka did, too. He was so passionate; this was clearly more important than TKD. When we met Steph and Matt, they immediately remembered Brandon as the really interested kid from the front row at school. 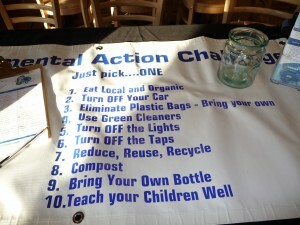 Their message is simple: each person can do ONE thing to reduce their carbon footprint. And they’re running through Canada and the US to spread the word. The money the raise will then go to seed child-initiated environmental programs. 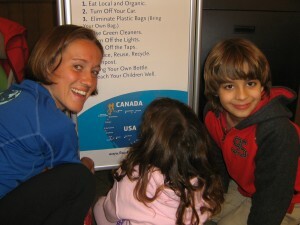 The kids and I reviewed the list and checked off what we already do: compost, use re-usable bags, by local & organic food (we LOVE our local CSA!! — thanks Polly and Susannah for pushing us to get involved), recycle, etc. Most touching, though, was the kids’ donations. I got teary-eyed when I recounted the story to Steph. We all got so wrapped up in Brandon and Mirka that they forgot to get video footage… so Steph came to our house the next day to video me and Brandon. We talked about how the environment is something Brandon is really passionate about, but Brandon was holding back a bit. Finally he whispered to me, “Mom, I’m afraid I might lose my composure.” I convinced him that it was okay — showing emotion was how he could show people his passion. Then we talked about how he could work to put his dream into action (just like Martin Luther King, Jr., who they had been learning about in school). I’m so proud of him. He’s a crazy storehouse of knowledge — he remembers everything he reads and shares his knowledge freely — but this passion and emotion on the environment was beyond that. 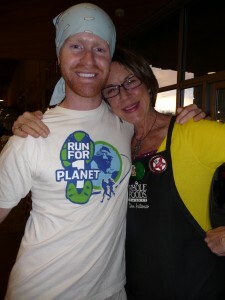 The whole experience reminded me to talk to the kids more about why we do what we do, like buying local produce (http://homesweetfarm.com/) and bugging them to turn off lights. And the kids reminded me to ignore what’s on the calendar every once in a while and go with what inspries us. I am still awed by their willingness to give tzedakah to a cause they believe in. Steph stayed for dinner that night, which thrilled the kids. It was a typical crazy weeknight at our house, but I think she was happy to join the bustle of a family dinner and we felt like we had really become friends. 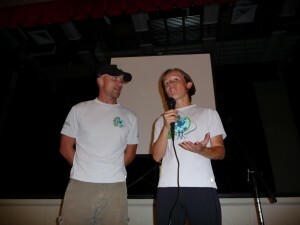 Two runners gave students at the Rawson Saunders School an entertaining lesson on how to save the planet. Matt Hill and Stephanie Tait are the founders of Run for One Planet, an 11,000 mile mission to run around Canada and the United States. 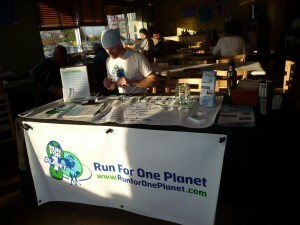 To make a donation to the Run for One Planet group, visit their Web site at www.runforoneplanet.com. 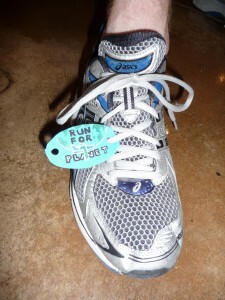 The running isn’t only about fitness; it’s about getting green, and teaching others how to do the same. Run for One Planet’s goal is to run a marathon everyday, inspire one million new actions for earth and raise $1 million for the group’s Legacy of Action for Kids. 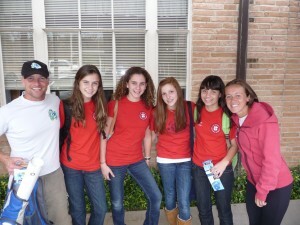 The Rawson Saunders School is a full curriculum school for elementary and middle school students with dyslexia.